Proven dental techniques with a 60 year track record. Consider all the options, including techniques rarely offered to patients. Do you really want to treat one tooth at a time? Our solutions address your mouth, teeth and gums. We even save teeth lacking structure above the gum. Has your dentist proposed extracting teeth? Thank you for taking care of my dental needs. You are an artist in your work. Having practiced many years as a general dentist, a specialist and teacher, I say anyone is fortunate to have you do their dentistry. You are aware of the patient’s comfort and show kindness to them and are painless. Your goal is perfection and are meticulous is whatever you do. I had my first cleaning and exam with this office today. They are really excellent and have earned my business. The cleaning was gentle, but thorough. The dentist was equally comprehensive in his approach to treating me; and I’m looking forward to addressing some dental issues that have gone unresolved for too long. Pratice is spotlessly clean. Friendly and efficient staff. Dental hygenist is very gentle and thorough. Dr. Feinberg is very knowledgable and personable. He spends ample time with the patient addressing their concerns. Great care, tried and true methodologies, long lasting results. Keep saving teeth; it beats the alternative 10:1. I am writing to you because I wanted you to know how much I appreciated your services. It now has been 9 years since you treated me. Before then I was a complete wreck in not being able to eat plus had the risk of loosing all my teeth. You certainly gave me life on my teeth in which other doctors quote’s were “You have 3 years before losing all of your teeth”, well you fooled all of them!! As I sat in your chair on my last visit in which as always you were mastering a crown on two teeth to perfection, I said to you there is a limit of knowledge doctors get in going to school. You have been so fortunate in working with the greatest of all doctors, your Dad. I am thrilled and delighted with your work you done for me and would be delighted to recommend you to anyone who wants a miracle change in their mouth. I wanted to express my gratitude for a painstaking procedure to achieve a perfect fit. I am sure that is exactly what you got and I was the beneficiary. Just a short note to thank you for my new tooth – it feels great, chews well, and has become a great new addition to my mouth!! You are a true perfectionist – I am very lucky to be a patient of yours. You don’t know how pleased I am with all the work you’ve done for me. People ask why I travel so far to see you and I can’t stop answering their question. I go on and on and as long as I can, you’ll be my one and only!! Thanks! Can’t begin to tell you what a difference you work has made in my life! You were right-No more horrible taste in my mouth when I remove the plate. Again, many, many Thanks for helping me out! Welcome to Dr. Feinberg’s office: a distinctive and one of a kind dental practice! 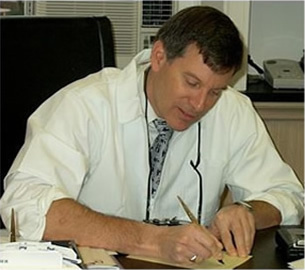 The mission of Dr. Feinberg is to “Educate” patients and colleagues alike, about the options and the techniques available for all types of dental issues. These techniques have allowed patients to enjoy restorations for 15 to 20 years without having to replace them. Our office will provide you, the patient, unsurpassed fully custom designed dental work completed in our own private, fully-equipped, in-office laboratory. Our office specializes in providing patients with evidence-based precision dentistry. The techniques we use for crown and bridgework, precision attachments, and implants have an incredible percentage of success which is documented in a library of over 100,000 slides, digital pictures and follow-up X-Rays taken during the last 50 years. The purpose of dental restorations is to prevent patients from losing their teeth. Successful dentistry lasts for many years in health, provides comfort and function, improves aesthetic appearance and includes a contingency plan in the event that something goes wrong. Our dentistry is created on sound engineering principles designed to prevent recurrent decay and periodontal problems. All of the dies, models and set-ups are fabricated in our in-office laboratory. The Doctor personally hand-carves each restoration to ideal shape and form according to a proven step-by-step technique. Great care is taken to ensure perfection and patient comfort throughout the entire process. As a result, a high percentage of our patients wear dentistry in excess of 20 years. Because of our unique approach to Restorative Dentistry, we have the ability to offer treatment options that may not be available elsewhere. Evidenced-based dentistry (EBD) is an approach to oral health care that requires the judicious integration of systemic assessments of clinically relevant scientific evidence, relating to the patient’s oral and medical condition and history, with the dentist’s clinical expertise and the patient’s treatment needs and preferences. Because we use a 3-dimensional approach that prepares the tooth, the gum and the bone to receive ideal dentistry, we are often able to salvage teeth that do not have tooth structure above the gum. Usually this is done without the use of posts. 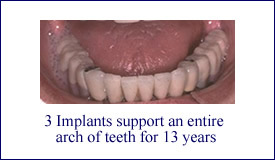 We prefer to save the patient’s own teeth whenever possible and use implants as a last resort. We specialize in removable partial dentures that contain no hooks or clasps. Our precision attachment cases are worn 24 hours a day and no one can tell that they are wearing removable bridgework. They require very little maintenance and do not need denture paste or powder. The documented evidence shows that these cases last longer than fixed bridgework cases—even when they are made on teeth with inadequate roots and bone! (Fixed bridgework in the front, removable bridgework in the back). We have been restoring cases with implants since they first came to this country in the 1980’s; and we have been making precision attachment cases successfully on implants for over 20 years. A great precision attachment case can be made on as few as 3 implants placed in the front of the mouth—avoiding the difficult anatomy and complications associated with placing implants in the back of the mouth. Implants are particularly important for restoring the lower arch. The worst restoration in dentistry is a lower denture because the muscles of the tongue and cheek continually dislodge the denture.